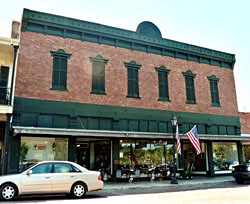 The Kaffie Building is a two-story Italianate mercantile building, constructed in 1893 as a general department store. The building was built by the Kaffie family, which had been running a business in Natchitoches since 1863. The business was begun by Adolph and Harris Kaffie, Jewish-Prussian immigrants. They sold all manner of items, from clothing and toys to farm tools and coffins. Over several years, their business prospered, necessitating the larger building in the 1890s and later becoming one of the largest and most successful general stores in northern Louisiana. The business was passed down from one generation to the next within the Kaffie family. In 1954, the Kaffie family allowed Titus Frederick to buy stock in the company, thus changing its name to Kaffie-Frederick. Titus had been a long time employee of the Kaffies, working in the store since 1920. Kaffie-Frederick Department Store is the oldest continuously run business in Natchitoches. Its survival is surprising because the business has changed little in the last century and a half. The business is still owned by the Fredericks and still functions as an old-style general store. The building, itself, also has changed little. It utilizes a skylight to help illuminate the store, and still operates an antiquated cargo elevator that was installed in the 1890s. 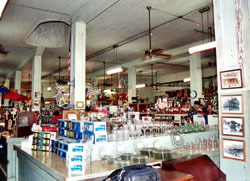 The floor and display cases are original to the building, and business is still conducted using antique cash registers. The Kaffie Building is located at 758 Front St. within the boundaries of the Natchitoches Historic District. It is open for business from 7:00am to 5:00pm, Monday-Friday and 7:00am to 4:30pm on Saturday. The business also runs a Christmas store on the top floor during the holiday season. Call 318-352-2803 for further information.